This is your career path to a free government degree without O/L or A/L. With or without GCE O/L or A/L degree now you can make progressive growth upto degree level with National Vocational Qualification (NVQ). What is NVQ (National Vocational Qualification) system? National Vocational Qualification (NVQ) System is nationally and internationally recognized vocational certification system. 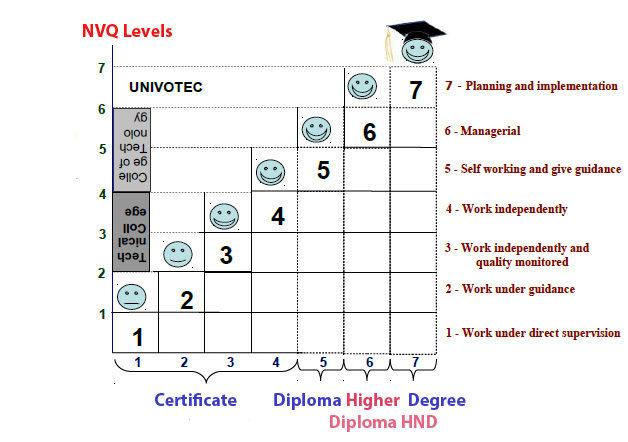 NVQ consists of 7 Levels, with different levels of courses such as certificate, diploma and degree at each level (see diagram). Many developed and developing countries have introduced vocational skill certification systems similar to that of the NVQ system. Where can I get Certificates, Diplomas, Higher Diploma and Degree Courses/ Training ? You can get training in various institutes conduct TVET courses in public private and NGO sector. There are 14 training delivery institutes and 382 vocational training centers under Ministry of Youth Affairs and Skills Development. time and part time basis. There are training programmes of duration six months to three years. You can get Diplomas in Colleges of Technology. There are nine of these Colleges in each Province. Higher National Diplomas can be obtained Sri Lanka Institute of Advanced Technical Education (SLIATE) and Institute of Engineering Technology (IET) Katunayake. Bachelor of Technology Degree can be obtained from University of Vocational Technology (UNIVOTEC). [jbox color=”yellow”]For More details on Training Institutes check our related post. What type of courses available? What is the industry acceptance of NVQ Holders? The selection of occupation for development of courses is based on labour market information which shows local and foreign demand. The development of teaching and learning resources in TVET system is based on the standard in each occupation or sector developed in collaboration with industry and training experts. Therefore acceptability of NVQ holders by the industry is very high. TVEC operates a labour market information system and disseminate information to its stakeholders through its bi-annual publication of the Labor Market Information(LMI) Bulletin and through its website. The LMI system makes use of newspaper survey reports, labour force survey reports, SLBFE reports, BOI reports etc. in its analysis and forecast.